It goes without saying that reporting on your call and visitor data is an essential piece of improving your marketing, sales, and support strategy — but some reports can be dense or difficult for other teams to parse out what the metrics are really saying. At CallTrackingMetrics, we have a number of powerful reporting tools built directly into our software for you to optimize your campaign strategy, recognize ROI on your marketing investments, and more. Yet we wanted to find a way to make these reports more visual and accessible for admins who need to quickly digest and share these insights out to other parties in their organization. Enter our newest integration with Google Data Studio. Google Data Studio is a great tool for building highly-visual, dynamic reports. As the demand for simple, beautiful reporting tools grows for businesses around the world, we recognized an opportunity to build a connection with their platform, in order to help your business streamline and display all your valuable call and visitor insights. 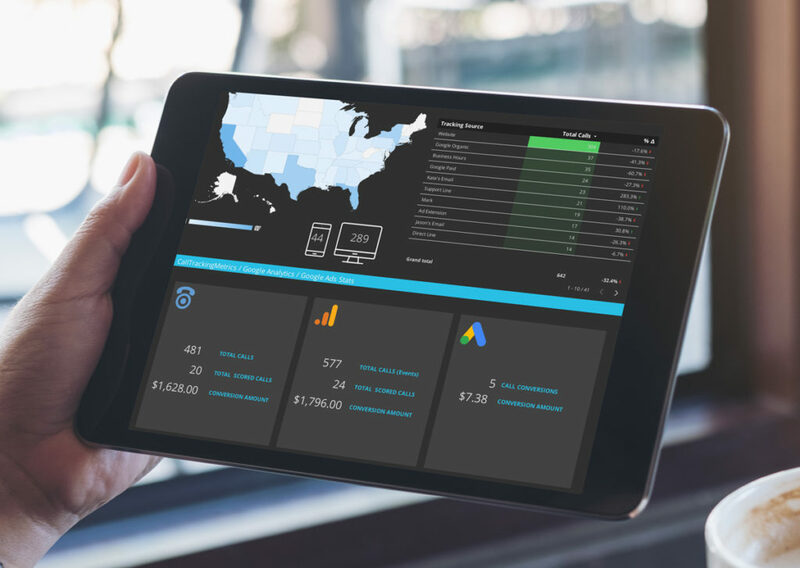 Plus, thanks to their pre-built data connectors with other popular platforms like Google Ads and Analytics, you can visualize all your data across the tools you’re using in one place. Call Log Connector — Gather raw data from your call log, using nearly every field as a possible metric so you can build advanced and highly customized reports using the full spectrum of your data. Activity Reports Connector — Pull existing data from your CallTrackingMetrics activity reports. This enables you to quickly and easily build Data Studio reports using those same dimensions. This helps cut down on the time to populate the report with data since it’s not pulling quite as many records, yet it lacks some of the personalizations available with the Call Log Connector. The integration is available to all plans and users on CallTrackingMetrics and requires an account with Google Data Studio. Learn more about setting up the integration here.